Tomorrow we plant the first of your veggies! 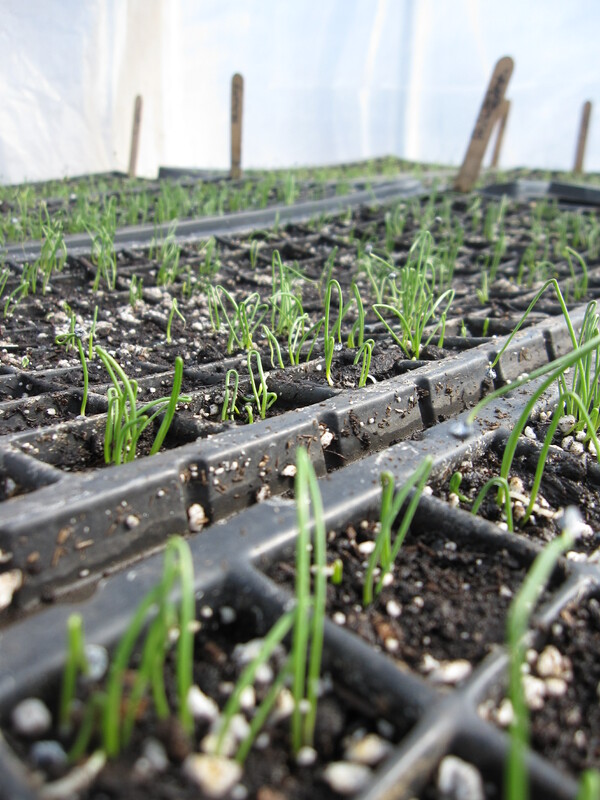 We’ll seed tens of thousands of onions, shallots and scallions into shallow trays filled with soil. These trays will go on top of heat mats in the greenhouse, to sprout and grow before being transplanted into the fields, one by one, in early April. That transplanting into cold, wet earth will be one of the first tasks we do with our new apprentices who will also arrive, ready to grow, in early April. And Cookie, our little pregnant Dexter heifer, will also be giving birth in April. It’s hard to believe it’s only one short month between now and then — so much to do to prepare for spring! Over one-quarter of our CSA shares have already been sold, so make sure to sign up soon, before we start promoting the CSA to the wider community. If you aren’t sure which of the add-on shares you’re interested in, make sure to attend the Mid-Coast CSA Fair this coming Sunday, March 3rd, from 1-3pm at the First Universalist Church, 345 Broadway, Rockland. Many of our add-on producers will be there for you to ask questions of and to sample their products. Nearly ten other CSA farms from the area will also be represented, so come check out the agricultural diversity and energy that CSA members and their farmers bring to the Mid-Coast! As always, please feel free to get in touch with any questions. We’ll continue to savor the relative quiet of March, and will use this time to it to gather our energy for the flurry of activity that April will bring. Hope to see you soon!